This was the first novel to be published by Carlos in his native country of Spain. However, this best selling author is perhaps better known to us within the book world, for his adult best sellers - "The Shadow Of The Wind" and "The Angels Game". After sitting at the top of the best sellers charts for many weeks (in Spain), and selling over 3 million copies of his young adult books, the time has now come for it to be translated into English. The Spanish author has written three other young adult books - 'The Midnight Palace', 'September Lights' and 'Marina', all of which will be translated and published within the next three years. 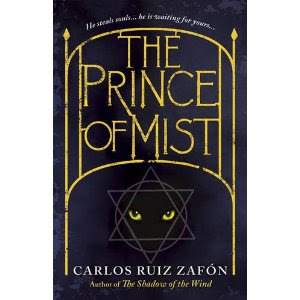 I for one, will be very pleased to read them all, just from the strength of 'The Prince of Mist'. When the author wrote this story, he had in mind a book that would appeal to all ages. Something that would hold as much meaning for a teenager, as it would entice and grip an older reader. That's the magic in this book for me, as the author has done just that. I was engrossed in every page, and turned each one wanting more and more. The books charm comes from the way in which you are drawn into the story and through the characters journey of discovery, which was breathtaking and one that I will be revisiting. This is such a good book for a person, who was really just starting his writing career. He has since quoted that "when I look back at everything I have written since, I feel that the seed of it all was contained in this little novel." Carlos is very clever at creating intrigue within his books. This classic Gothic book, based on a story featuring ghostly statues, a haunted ship and the legend of the Prince of Mist, sets your mind racing. And yet it grips with a chilling fear that stays with you right to the very end. Max Carver's father - a watchmaker and inventor - decides to move his family to a small town on the coast, to an old house that once belonged to a prestigious surgeon, Dr Richard Fleischmann. But the house holds many secrets and stories of its own. Behind it is an overgrown garden full of statues surrounded by a metal fence topped with a six-pointed star. When he goes to investigate, Max finds that the statues seem to consist of a kind of circus troop with the large statue of a clown at its centre. Max has the curious sensation that the statue is beckoning to him. As the family settles in they grow increasingly uneasy: they discover a box of old films belonging to the Fleischmanns; his sister has disturbing dreams and his other sister hears voices whispering to her from an old wardrobe. They also discover the wreck of a boat that sank many years ago in a terrible storm. Everyone on board perished except for one man - an engineer who built the lighthouse at the end of the beach. During the dive, Max sees something that leaves him cold - on the old mast floats a tattered flag with the symbol of the six-pointed star. As they learn more about the wreck, the chilling story of the Prince of the Mists begins to emerge. The ending of the book delivers an almighty punch - drawing together the emotional characters, thrilling suspense and chilling experiences. It whips up a storm that leaves the reader thinking: that was one of the best books that I have read this year. It has everything I like in a book and much, much more. I look forward to reading more from Carlos Ruiz Zafon very soon. i'm glad to read a positive review of this one. i loved the shadow of the wind, but really disliked the angel's game. i was hoping this one would be better and sounds like it is!